Home Study course for professionals to obtain Advanced Qualification as a Breast Cancer Recovery BOSU® Specialist. Home Study Modules & Testing Included. 1 Year MedFit Network membership and 2 year CETI CES listing included ($569 Total Value). Hard copy handbooks available upon request, pay only shipping fees. Two Year listing on our International Cancer Exercise Specialist Directory-bringing clients to you. This is a professional training and business support package combined with the Home Study training that is worth over $569 and only available with CETI. The Breast Cancer Recovery BOSU® Specialist Advanced Qualification was developed for health and fitness professionals seeking to attain a higher level of mastery and work with breast cancer patients during and after cancer surgery and treatment and into survivorship. Participants will gain a complete understanding of the entire breast cancer process from diagnosis and treatment to reconstruction and survivorship. Our unique and individualized programming will help to improve the patient’s ability to cope with the mental and physical stress following cancer diagnosis and treatment. Using the BOSU® Balance Trainer, participants will learn how to prescribe corrective exercises for muscle imbalances and range of motion deviations, as well as exercises to promote lymph drainage. 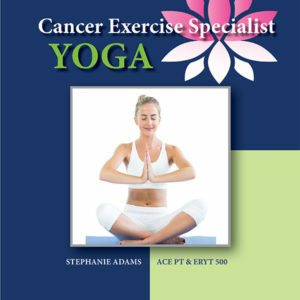 The coursework is founded on collaboration with the chiefs of breast surgery at Georgetown, George Washington, and Johns’ Hopkins University Hospital Medical Centers, and developed by Andrea Leonard, 35-year cancer survivor, 2019 PFP Personal Trainer of the Year, author of “Essential Exercises for Breast Cancer Survivors,” ACE Certified Personal Trainer, NASM Corrective Exercise Specialist and Performance Enhancement Specialist, and President/Founder of the Cancer Exercise Training Institute. She is truly a pioneer in the field of cancer and exercise and has paved the way for other organizations to follow. Coursework research began in 1995 and is now in the 3rd edition with updated research added annually. How does the Advanced Qualification home study differ from other available cancer exercise training programs? * Ability to ask questions and have them answered through email, phone, and blog. * Home study participants will gain access to online handbooks and online video modules. Hard-copy handbooks may be ordered for an additional charge. * Open-book online examination to be taken at home within 180 days of purchase. We believe that the open-book nature of this examination simulates real life situations more closely than anxiety ridden, proctored, examination hall examinations. * We offer professional development and continuing education as well as a video library for CETI Specialists exclusively. * Receive a complimentary 2-year listing on our International Cancer Exercise Specialist Directory-bringing clients to you. * Purchase the Advanced Qualification package and receive a one year membership to the Medical Fitness Network (value $169). The MedFit Network will help you reach new clients who are looking for fitness and allied health professionals with these skills. By purchasing you agree to the terms and conditions for delivery and refunds. Home Study & Testing Materials – You will receive immediate access to training materials and a separate email containing test login information and instructions. Downloadable files are available for 180 days.